Too Old For A Full Moon Party? So, I found myself on Koh Phangan awaiting the Full moon Party. We rocked up to the island (which is very pretty by the way) 4 days early and surveyed Haadrin beach from our bungalows. I guess I’m not that old but I did find myself questioning whether my days of all night parties, UV paint and Graham Gold (yep he’s still going) should be left in the past or whether for one night only I should throw caution to the wind and embrace the hedonistic beach party. The day arrived and the rain came down. 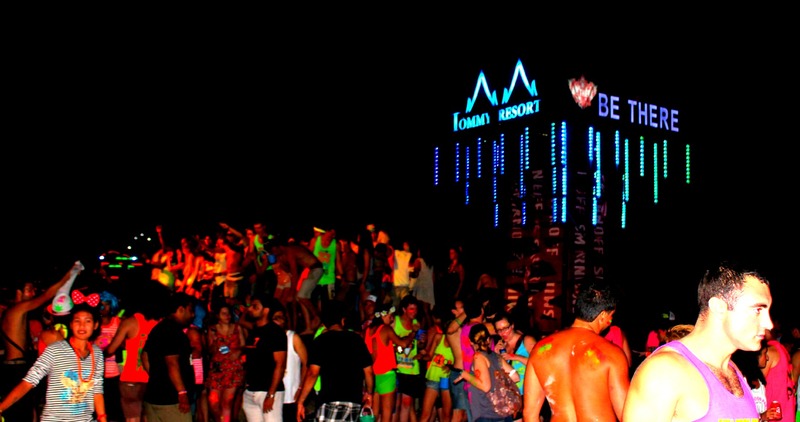 I was secretly pleased that the monsoon would surely mean that the Full Moon Party would be cancelled. Oh no, no such luck. Mr T, our delightful resort manager was adamant that the show would go on. So we headed out to the shops for our armour (aka our Full Moon outfits). If we were going to brave it then it’s important to blend in with the masses. Also very important that my capsule travelling wardrobe didn’t get splattered with neon paint! We also stocked up on buckets from a shop rather than the beach. We bought sealed bottles so we could mix them ourselves. We decided this was the safest root to not being drugged and waking up naked on another island. We planned our party experience with military precision – forced fun anyone?! Feeling very old at this point! We ate a decent lunch to line our stomachs and then just kind of sat and waited, twiddling our thumbs wondering at what time one should start the Full Moon celebrations. Unlike any good festival there was no agenda. Then we just thought screw it we need to go big or go home! We popped out for a few cocktails to get us in the mood (it worked) and then got our outfits on. We tucked into the buckets whilst painting each other in neon yellows, pinks and blues. Things got a little more action packed when the drinking games started. The simple name game became hysterical when your forfeit wasn’t just to drink but the person to your right got to paint whatever they wanted on you. The result being we were all covered in neon penises before we even left the bungalow. Yep, pure class here. In a blur we headed to the action at the beach. Huge sound systems pumped out house and trance and the masses danced in the sea, the sand and dodgy looking wooden stages. We got stuck in and even though I may have popped back for a power nap at some point I definitely saw the sun come up on Haadrin beach in the morning hours. Was I too old? Nope. Would I do it again? Probably not. But it was hilarious, mainly so because the friends I went with were so entertaining that it was impossible not to laugh lots and get stuck in. ← The Magical Island of Koh Tao.